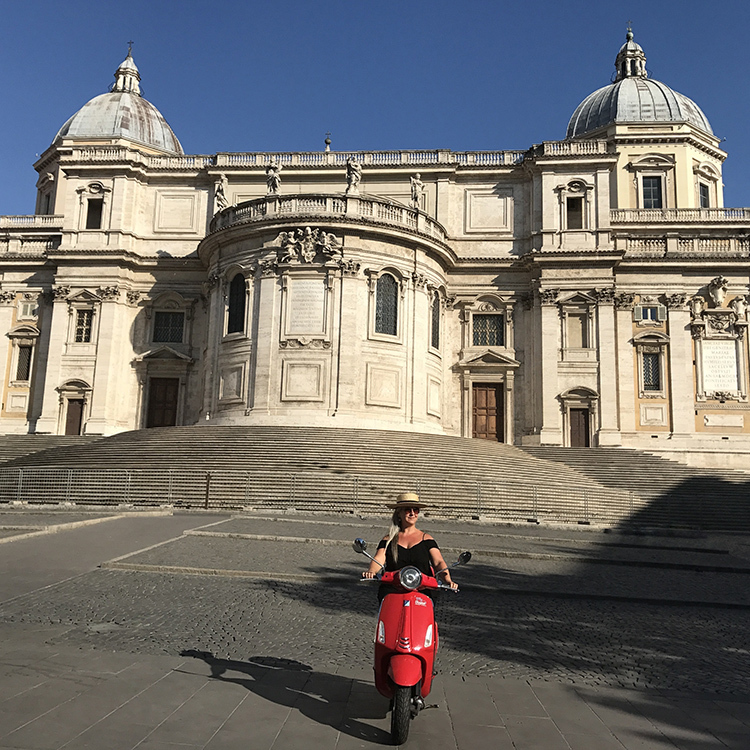 So there really isn’t a better way to get around the stunning city of Rome than on a Vespa! And in our case a fabulous red one which was so much fun with glorious weather, this magical city and the Italian drivers who actually weren’t anywhere near as speedy or as impatient as we had expected! There are many Vespa hire places dotted around the city but we went with My Vespa Tours & Rental on Via Cavour. 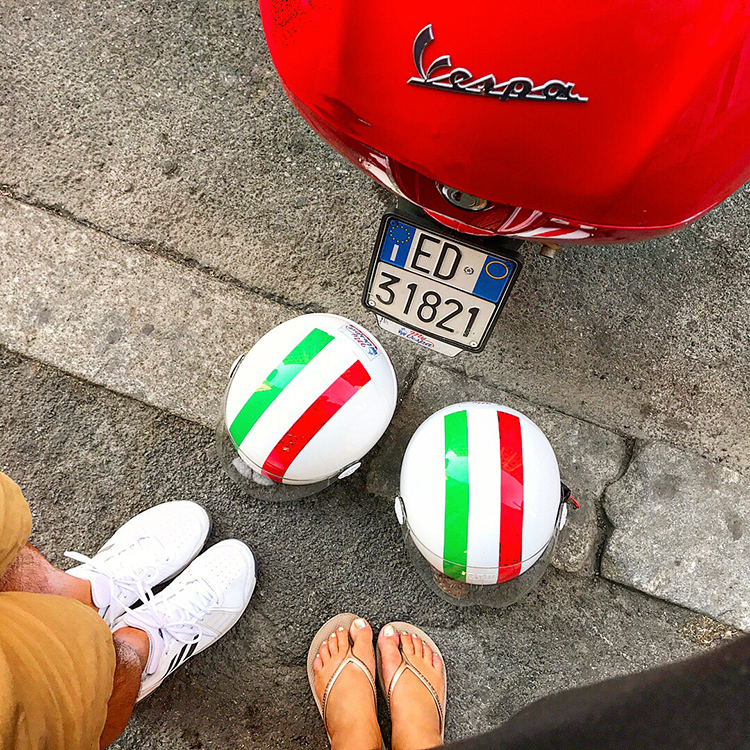 Lots of lovely colourful Vespas to choose from along with super friendly and helpful staff – who all spoke English – along with reasonable prices (well by Rome standards anyway!!). So once you are all set up the first handy thing to know is that FREE moped/vespa parking is everywhere! So easy to find and spot as there are clearly marked, white lined bays for bikes a plenty in most of the streets! 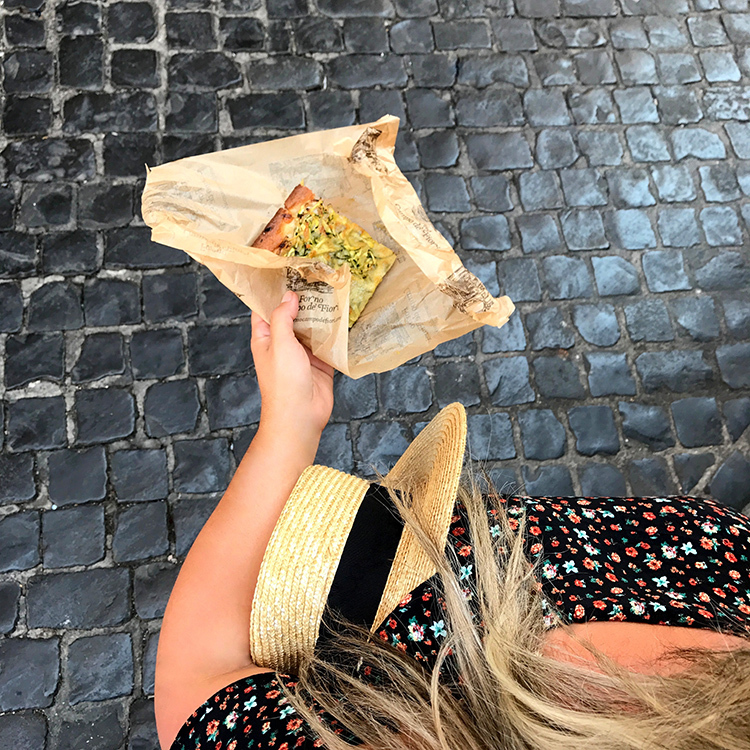 Then one of our first stops to recommend is the delicious ‘pizza al taglio’ from FORNO which is a really small place found on the main square of Campo de’ Fiori. Don’t be fooled by it’s very understated entrance though as you will quickly see that everyone around it is eating their famous and quite frankly heavenly pizza pieces! Loads of different toppings to choose from which are all continuously and freshly made – it really does fly out the door! You buy it by the slice, cut to the size you fancy, which is very dangerous as with eyes bigger than our bellies we always manage to over order !! Another easy find and important to look out for are the very cute, single petrol pumps that you’ll come across throughout the city. There is no space for any big service stations in the centre so these pumps are super handy! And, as in all of Italy, you don’t have to fill up yourself as there is always an attendant. And when isn’t it time to stop for ‘gelato’! And as expected there are hundreds of places to get an ice cream. But our absolute favourite place (and believe us when we say we’ve seriously researched this over the years!!) it is DELLA PALMA which can be found just off of the Pantheon in Via della Maddalena. There are an impossible 150 flavours to choose from and our mission is to try them all over time! 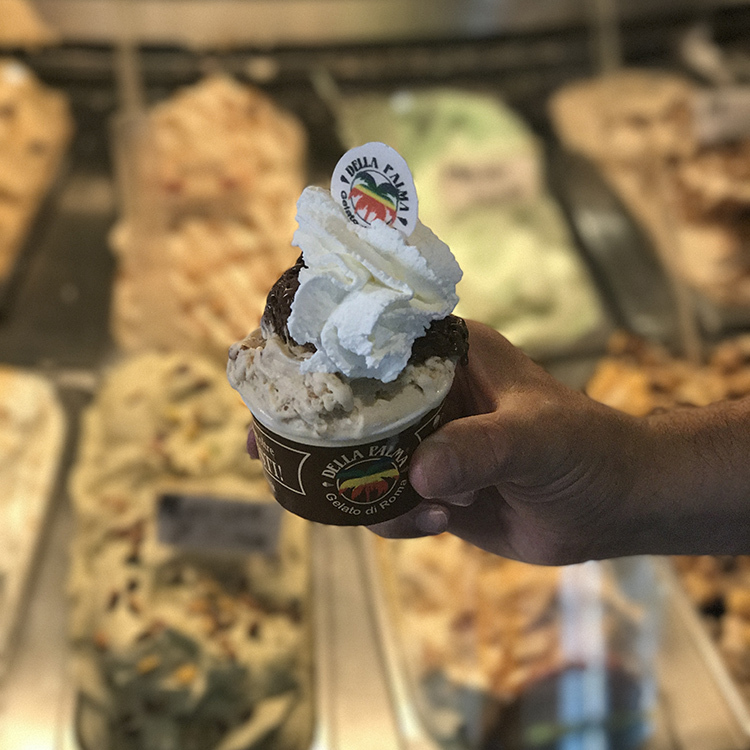 You really won’t find better gelato for flavour and texture – absolutely heavenly! 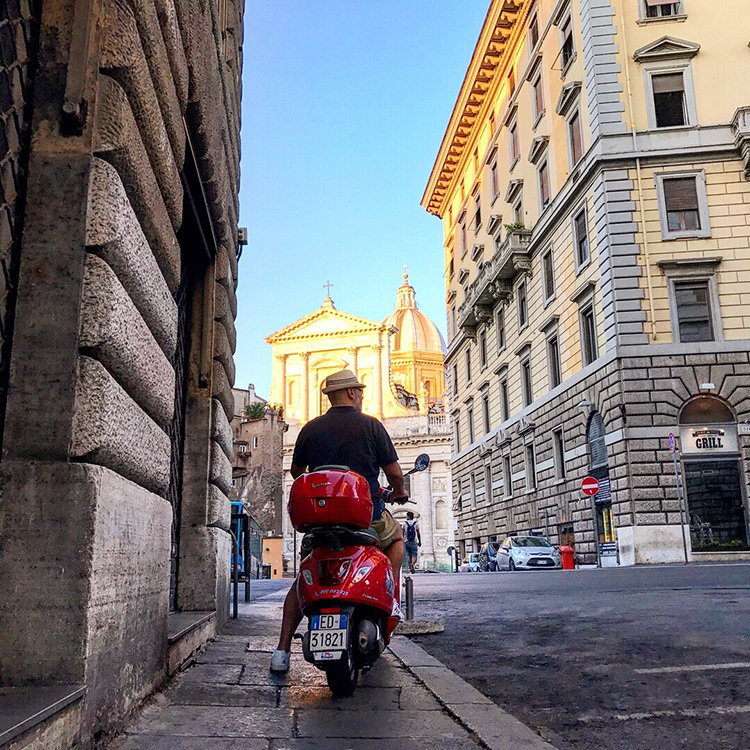 The freedom on a Vespa is fantastic as you can drive straight up to all of the main piazzas, explore all of the back streets that would take days to walk and you can easily climb the steeper areas finding incredible hidden gems of views across the city! 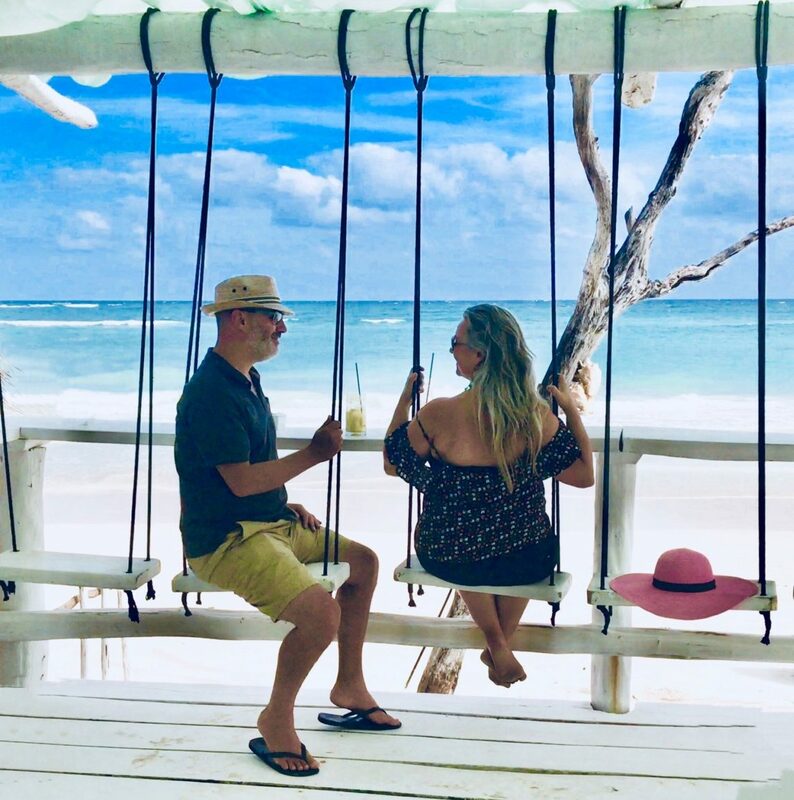 One of our favourite jaunts was to drive down one side and then back down the other of the Tiber River which is tree line shaded and very beautiful! 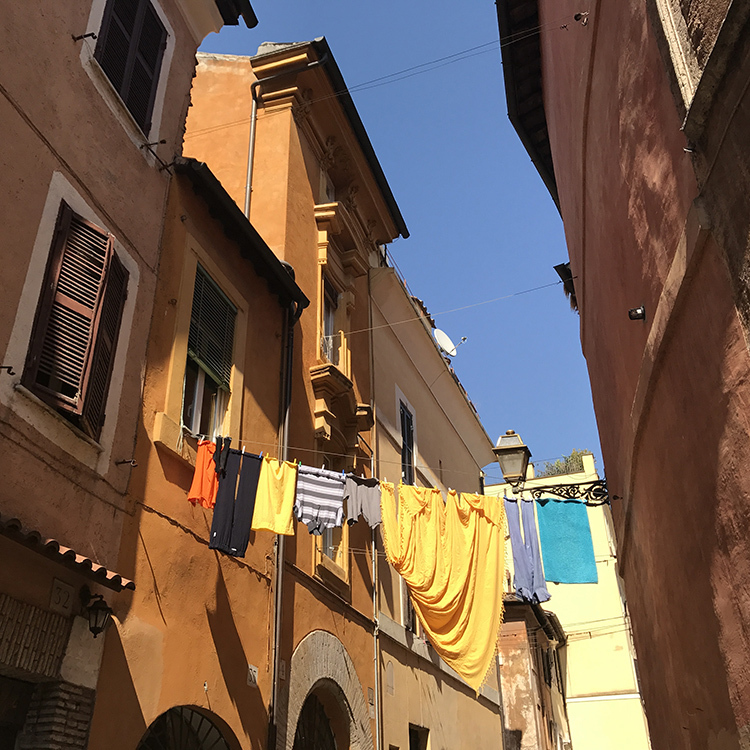 Trastevere we found to be the hardest area to drive around as it was all a one way system that just didn’t make sense and/or get you very far! 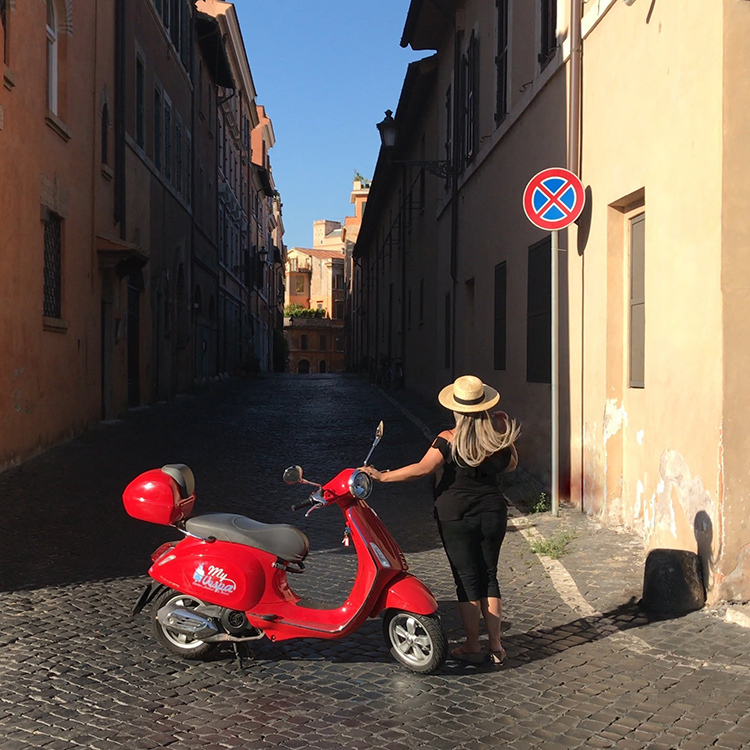 All in all it is a dream to whizzz around Bella Roma on a Vespa … the city is like some amazing film set at every turn which you would never tire of seeing and exploring … needless to say we will be back again for new Vespa adventures soon!